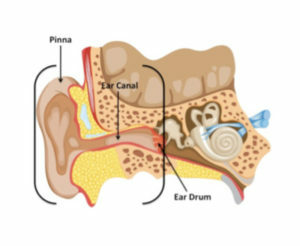 The outer ear consists of the visible part of the ear (pinna), the ear canal and the ear drum. 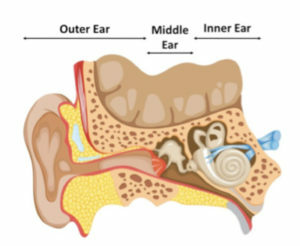 Sound waves are collected by the outer ear and are channelled toward the eardrum. 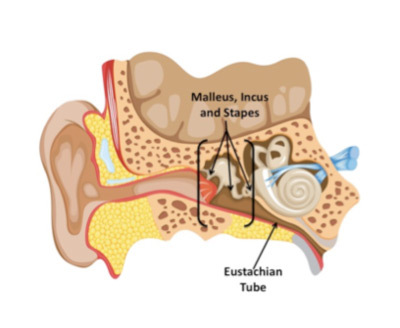 The eardrum begins to vibrate. 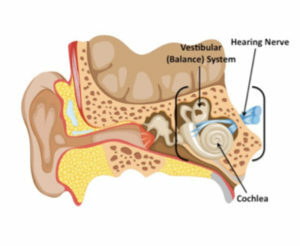 The inner ear consists of the cochlea and the vestibular (balance) system. The cochlea is a snail-shaped bone filled with fluid and thousands of tiny “hair cells” that process sound vibrations. Vibrations enter the cochlea and the fluid is set into motion, like a wave, and the hair cells move in response. When the hair cells move, they send electrical signals along the hearing nerve and toward the brain. The brain then processes these signals to help us understand what we have heard.